While the last couple of trips have been for bass, Bobby and I were able to get out today and chase panfish. 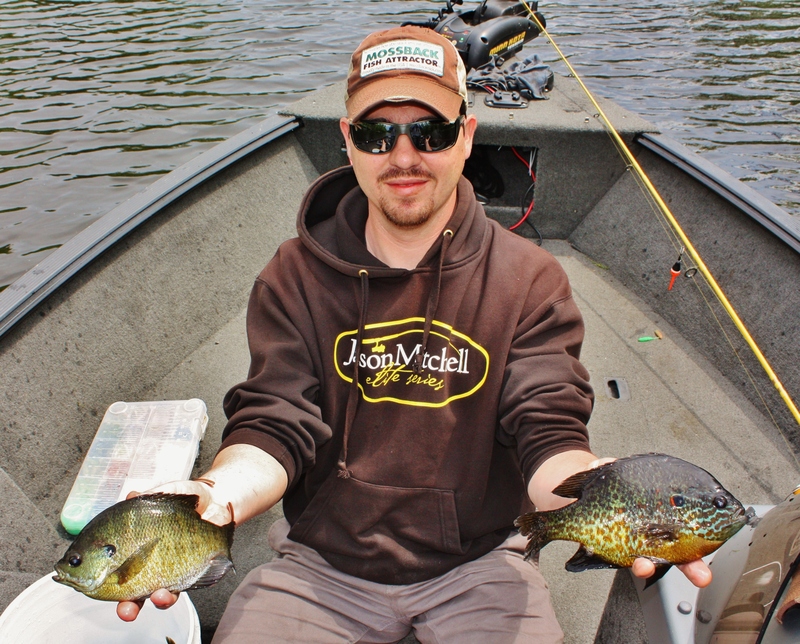 The bite for crappie has been tough so we decided that pumpkinseed and bluegills were the way to go. We found a stretch of flooded timber that was sheltered from the wind so we called it home for a couple of hours. The seeds and gills seemed to be coming in to spawn because there were only short periods of time where there were no fish. Basically, we found that pockets of shade adjacent to trees held, or at least attracted the fish to hug it when passing by. Even though the bluegill and pumpkinseed were lots of fun, we had to at least try our hand at crappie. We started drifting a large weedy flat that they frequent post spawn. After about a fishless 15 minute drift, Bobby’s bobber took the first dip since the move. It wasn’t a crappie but we hit a mother load of yellow perch ranging from 8-12″. It was one of those times when you could do no wrong. We set the electric anchor on the trolling motor and made 15-20 foot casts for the next 30 minutes. Every cast either yielded a perch or at least multiple bites. While the bite was great, a heavy rain rolled in and we decided a few perch weren’t worth getting wet at this point in the day so we loaded up and headed for home.